What is Shortcut Virus and How it Spread. When we connect a flash drive to a infected computer and transfer any file it automatically infect pendrive and all files shown as Shortcut. This virus can affect any external storage like Flash Drives, External Hard disk, Phone Memory, Memory card or any Memory Stick, this is an anonymous malware which initially released online and spreading from one computer to another and we got Shortcut of files which are in USB drive if you try to open any file you will get error message. If your USB drive don’t have important files you can try to Format it, but if it contains important files then you are not going to format it, to Remove Shortcut Virus follow the Steps Below. Step 2. Navigate to Flash Drive by typing its letter. [ Lets Say it is i ], to find your USB drive letter open “My Computer” and check for letter, type i: and hit enter. Step 4. Now type ” attrib -s -r -h *. * /s /d /l ” ( without quote ) and hit Enter . It will take few seconds to recover all your files, Now open your Flash Drive you will get Back all of your files. How to Remove Shortcut Virus from Computer. Once you recover files into USB drive you can use them but if you again plug in USB Flash drive into infected computer your flash drive will infect again, so it is better to remove source of this virus i,e infected computer, follow the steps below to remove shortcut virus from computer. Step 1. First open Task Manager by pressing Ctrl + Alt + del Or Right Click on taskbar and click on Task manager. Step 2. Go to Process tab and look for process Wscript.exe , Scroll down and find any such process, Now Right Click on it and Click on End Task. Here look for Registry Key “odwcamszas” if found then right click on it and delete this registry key. This will remove Shortcut Virus from your Computer, if not then try these steps. 1. Press windows + R key, you will get Run box, type %temp% here and hit OK, now temp folder will be open look for file nkvasyoxww.vbs and delete it. 2. Go to C:Users<username>AppDataRoamingMicrosoftWindowsStart MenuProgramsStartup. Check Startup folder if nkvasyoxww.vbs exist here then delete it. 3. Press Windows + R key, type “msconfing” into run box and hit OK, it will open System Configuration, Go to Startup tab, and look for nkvasyoxww.vbs uncheck it from startup and hit OK. 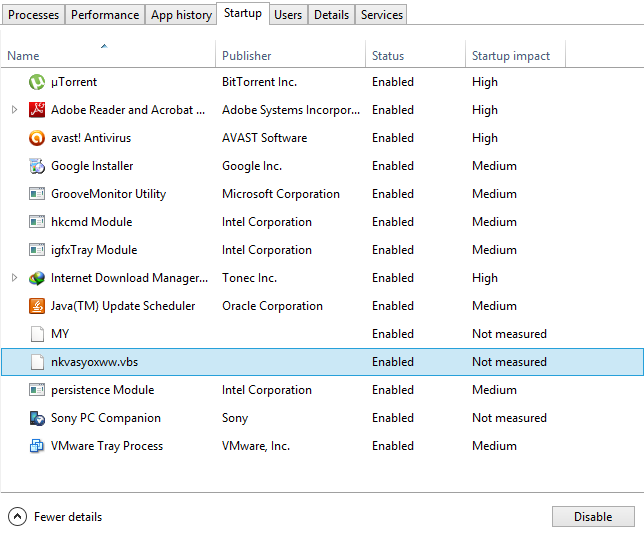 In Windows 8, Open Task Manager and go to Startup tab, disable nkvasyoxww.vbs from here. This will remove Shortcut Virus form your Computer or Laptop, if you face any problem feel free to comment below. Make sure you have complete protection installed into your computer like Kaspersky Total Security if not please download and install Kaspersky Total Security or any other antivirus which provide protection from every kind of threat.